Astronomers using ESO’s Very Large Telescope (VLT) have discovered a quasar with the most energetic outflow ever seen, at least five times more powerful than any that have been observed to date. When a star goes supernova, it creates a pulsar. These are extremely dense neutron stars that are highly magnetized and rotate emitting a beam of electromagnetic radiation. Pulsar is short for "pulsating star". The Crab Nebula contains a pulsar that rotates at a rate of 30 times per second. Compared to a pulsar, a quasar does not have a neutron star at its center. Instead of a neutron star, it has a black hole; a super-massive black hole that astronomers call 'monsters'. Quasars are the extremely bright cores of galaxies that are powered by a 'monster' black hole. They are as bright as a thousand stars combined. This is because the black hole is consuming nearby stellar gas material at a very fast rate causing friction that the gas heats up and generates energy as it falls into the black hole. This energy is seen as light. From the vantage point of the Earth, a quasar would be as bright as a star a billion light years away or if there was a quasar 10,000 light years away from Earth, the light seen from the quasar would be comparable to the light of a full moon. If there is a quasar in the middle of the Milky Way, its light would not be as visible to the Earth because of the stellar dust and gas between the Earth and the core which would block the light. Quasar is short for "quasi-stellar radio source". 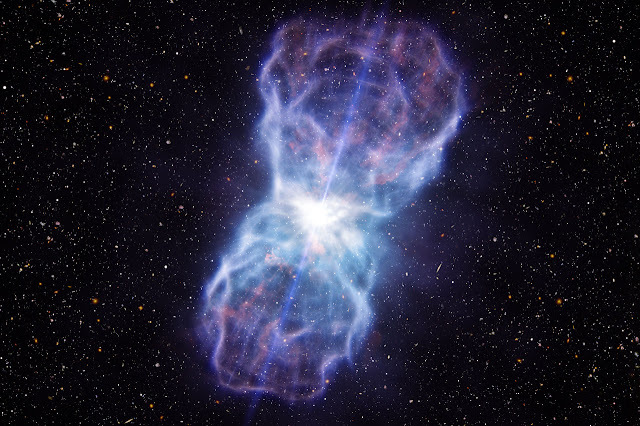 Astronomers using ESO’s Very Large Telescope (VLT) have discovered a quasar with the most energetic outflow ever seen, at least five times more powerful than any that have been observed to date. Quasars are extremely bright galactic centres powered by supermassive black holes. Many blast huge amounts of material out into their host galaxies, and these outflows play a key role in the evolution of galaxies. But, until now, observed quasar outflows weren’t as powerful as predicted by theorists. Quasars are the intensely luminous centres of distant galaxies that are powered by huge black holes. This new study has looked at one of these energetic objects — known as SDSS J1106+1939 — in great detail, using the X-shooter instrument on ESO’s VLT at the Paranal Observatory in Chile . Although black holes are noted for pulling material in, most quasars also accelerate some of the material around them and eject it at high speed. Many theoretical simulations suggest that the impact of these outflows on the galaxies around them may resolve several enigmas in modern cosmology, including how the mass of a galaxy is linked to its central black hole mass, and why there are so few large galaxies in the Universe. However, whether or not quasars were capable of producing outflows powerful enough to produce these phenomena has remained unclear until now . The newly discovered outflow lies about a thousand light-years away from the supermassive black hole at the heart of the quasar SDSS J1106+1939. This outflow is at least five times more powerful than the previous record holder . The team’s analysis shows that a mass of approximately 400 times that of the Sun is streaming away from this quasar per year, moving at a speed of 8000 kilometres per second. As well as SDSS J1106+1939, the team also observed one other quasar and found that both of these objects have powerful outflows. As these are typical examples of a common, but previously little studied, type of quasars , these results should be widely applicable to luminous quasars across the Universe. Borguet and colleagues are currently exploring a dozen more similar quasars to see if this is the case. The team observed SDSS J1106+1939 and J1512+1119 in April 2011 and March 2012 using the X-shooter spectrograph instrument attached to ESO’s VLT. By splitting the light up into its component colours and studying in detail the resultant spectrum the astronomers could deduce the velocity and other properties of the material close to the quasar. The powerful outﬂow observed in SDSS J1106+1939 carries enough kinetic energy to play a major role in active galaxy feedback processes, which typically require a mechanical power input of roughly 5% of the luminosity of the quasar. The rate at which kinetic energy is being transferred by the outflow is described as its kinetic luminosity. SDSS J1106+1939 has an outflow with a kinetic luminosity of at least 1046 ergs s−1. The distances of the outflows from the central quasar (300–8000 light-years) was greater than expected suggesting that we observe the outflows far from the region in which we assume them to initially accelerated (0.03–0.4 light-years). A class known as Broad Absorption Line (BAL) quasars.